Its that time of year again and it comes around quickly. The annual Dragonboat Boat Blessing and we have ours this coming Saturday. Many clubs across Hong Kong are doing their boat blessings at the moment. RHKYC and Typhoons held one earlier in the month, Buzz Dragons held theirs last weekend, VRC have theirs tomorrow in Deep Water Bay. Stormys are pretty lucky in that we are based in the village of Tai Tam Tuk, a pretty old fishing village on the southside of Hong Kong island with a massive history of dragonboat racing. 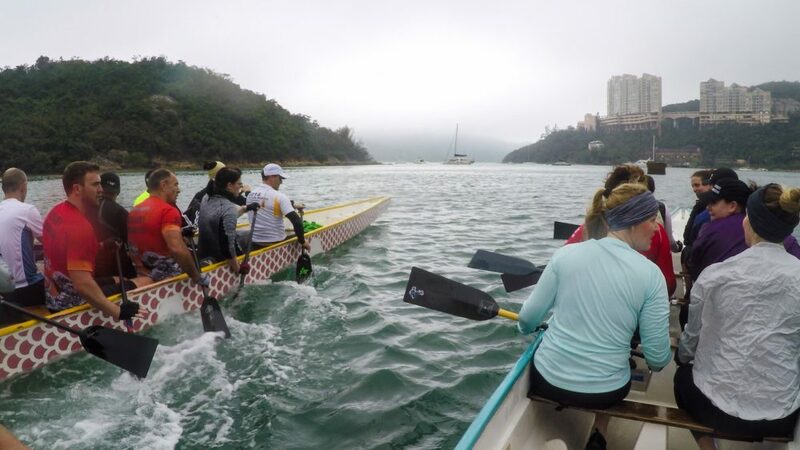 We share our playground with Tai Tam Tuk Fishermans Team and the Hong Kong Japanese Dragonboat Club. We have a temple in the village that we make our offerings too, bless the boats and then wake the dragons by paddling out in line with the temple and charging it three times making as much noise as possible – not hard with this team! This entry was posted in Stormy News and tagged BoatBlessing, community, Dragonboat, fishingvillage, HongKong, HongKongCulture, Paddle, Paddling, PigPigPig, Roastpig, Sportsteam, springrolls, WaketheDragons, Watersports by Vicki Easton. Bookmark the permalink.